Join Us for a Mother to Be Spa & Tea Event on Friday March 15th! Download "Mother to Be Spa & Tea "
Notice to our patients: This health center receives HHS funding and has Federal Public Health Service (PHS) deemed status with respect to certain health or health-related claims, including medical malpractice claims, for itself and its covered individuals. We are proud to announce that we have been awarded a grant and a Certificate of Achievement by the Health Resources and Services Administration (HRSA). You can read more in the attached document! Thank you for your continued support! 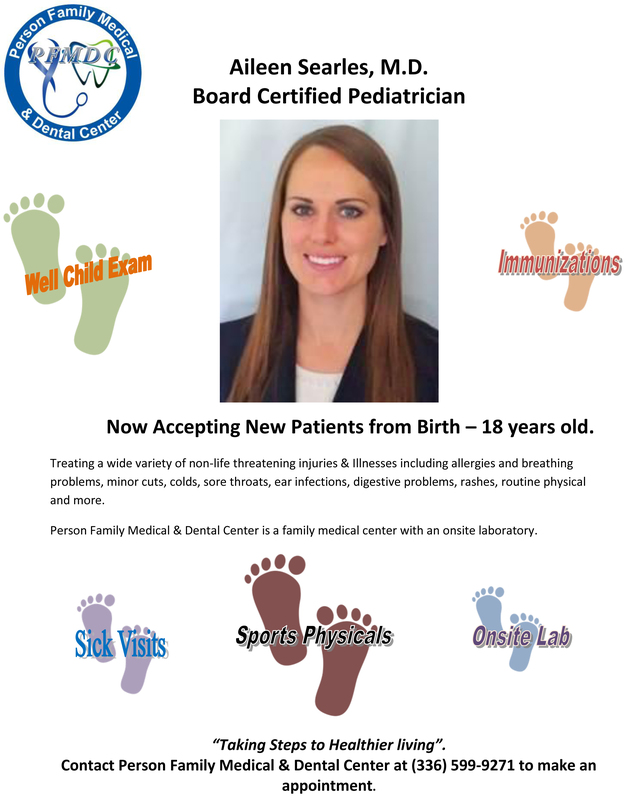 Download "Certificate of Achievement for Person Family Medical Center Inc. "
Established in 1980, The Person Family Medical Center is a Federally Qualified Health Center (FQHC) located in Roxboro, NC. Our Dental Center was established in 1996 and provides superior dental service. For the convenience of our patients and to better serve you, a second satellite dental clinic was established in 2008 in Yanceyville, NC. The Person Family Medical Center offers a variety of affordable and high quality health services including primary care, dental, nutrition counseling, diabetes education, behavioral health, and outreach services to the community.